For other uses, see beatitudes (disambiguation). The Beatitudes are eight blessings recounted in the Sermon on the Mount in the Gospel of Matthew. Each is a proverb-like proclamation, without narrative, "cryptic, precise, and full of meaning. Each one includes a topic that forms a major biblical theme". Four of the blessings also appear in the Sermon on the Plain in the Gospel of Luke, followed by four woes which mirror the blessings. The term beatitude comes from the Latin noun beātitūdō which means "happiness". In the Vulgate (Latin), the book of Matthew titles this section Beatitudines, and "Beatitudes" was anglicized from that term. Each Beatitude consists of two phrases: the condition and the result. In almost every case the condition is from familiar Old Testament context, but Jesus teaches a new interpretation. Together, the Beatitudes present a new set of Christian ideals that focus on a spirit of love and humility different in orientation than the usual force and exaction taken. They echo the ideals of the teachings of Jesus on mercy, spirituality, and compassion. While opinions may vary as to exactly how many distinct statements into which the Beatitudes should be divided (ranging from eight to ten), most scholars consider them to be only eight. These eight of Matthew follow a simple pattern: Jesus names a group of people normally thought to be unfortunate and pronounces them blessed. The eight Beatitudes in Matthew 5:3–12 during the Sermon on the Mount. R. T. France considers verses 11 and 12 to be based on Isaiah 51:7. The Beatitudes unique to Matthew are the meek, the merciful, the pure of heart, and the peacemakers. The other four have similar entries in Luke, but are followed almost immediately by "four woes". The four Beatitudes in Luke 6:20–22 are set within the Sermon on the Plain. Verse 20 introduces them by saying, "and he lifted up his eyes on his disciples, and said"
Luke 6:23 ("Rejoice ye in that day, and leap for joy: for, behold, your reward is great in heaven: for in the like manner did their fathers unto the prophets.") appears to parallel the text in Matthew 5:11-12, which reads, "Blessed are you when people insult you, persecute you and falsely say all kinds of evil against you because of me. Rejoice and be glad, because great is your reward in heaven, for in the same way they persecuted the prophets who were before you". Woe to you who are rich, for you have already received your comfort. The fourth "woe" in verse 26 may be parallel to the commentary in Matthew 5:11-12. These woes are distinct from the Seven Woes of the Pharisees which appear later in Luke 11:37-54. Each Beatitude consists of two phrases: the condition and the result. In almost all cases the phrases used are familiar from an Old Testament context, but in the Sermon on the Mount Jesus elevates them to new levels and teachings. Together, the Beatitudes present a new set of ideals that focus on love and humility rather than force and exaction. They echo the highest ideals of Jesus' teachings on spirituality and compassion. The term "the meek" would be familiar in the Old Testament, e.g., as in Psalms 37:11. Although the Beatitude concerning the meek has been much praised even by some non-Christians such as Mahatma Gandhi, some view the admonition to meekness skeptically. Friedrich Nietzsche in On the Genealogy of Morals considered the verse to be embodying what he perceived as a slave morality. In Christian teachings, the Works of Mercy, which have corporal and spiritual components, have resonated with the theme of the Beatitude for mercy. These teachings emphasize that these acts of mercy provide both temporal and spiritual benefits. The theme of mercy has continued in devotions such as the Divine Mercy in the 20th century. The phrase "poor in spirit" (πτωχοὶ τῷ πνεύματι) in Matthew 5:3 has been subject to a variety of interpretations. A. W. Tozer describes poverty of spirit as "an inward state paralleling the outward circumstances of the common beggar in the streets." These blessed poor are no longer slaves to the tyranny of things. They have broken the yoke of the oppressor; and this they have done not by fighting but by surrendering. Though free from all sense of possessing, they yet possess all things. "Theirs is the kingdom of heaven." William Burnet Wright, seeking to avoid a common misunderstanding of the meaning of poverty of spirit, distinguishes those who are "poor in spirit" from those he calls "poor spirited," who "consider crawling the Christian's proper gait." There are men who fear to call their souls their own, and if they did, they would deceive—themselves. At times such men baptize their cowardice in holy water, name it humility, and tremble. ... They are not blessed. Their life is a creeping paralysis. Afraid to stand for their convictions, they end by having no convictions to stand to. 1. "Blessed are those who remain faithful while enduring evils inflicted on them by others and forgive them from their heart." 2. "Blessed are those who look into the eyes of the abandoned and marginalized and show them their closeness." 3. "Blessed are those who see God in every person and strive to make others also discover him." 4. "Blessed are those who protect and care for our common home." 5. "Blessed are those who renounce their own comfort in order to help others." 6. "Blessed are those who pray and work for full communion between Christians." Yea, blessed are the poor in spirit 'who come unto me,' for theirs is the kingdom of heaven (3 Nephi 12:3). And blessed are all they who do hunger and thirst after righteousness, for they shall be filled 'with the Holy Ghost' (3 Nephi 12:6). Blessed the soul that hath been raised to life through My quickening breath and hath gained admittance into My heavenly Kingdom. The Qur'an quotes the Bible only in Q:21:105 which resembles Psalm 25:13 referred to in Matthew 5:5; but the Qur'an uses "righteous" rather than "meek". The Qur'an (e.g., "say the word of humility and enter the gate of paradise") and some Hadith (e.g., "My mercy exceeds my anger") contain some passages with somewhat similar tone, but distinct phraseology, from the Beatitudes. The Bhagavad Gita and the traditional writings of Buddhism (e.g., some of the Mangala Sutta) have been interpreted as including teachings whose intentions resemble some of the messages of Beatitudes (e.g., humility and absence of ego), although their wording is not the same. 1 2 Ross, Allen. "The Beatitudes (Matthew 5:1-12) An Exposition of the Gospel of Matthew". Retrieved September 4, 2013. 1 2 3 4 Majerník, Ján; Ponessa, Joseph; Manhardt, Laurie Watson (2005). The Synoptics: Matthew, Mark, Luke. Steubenville, OH: Emmaus Road. pp. 63–68. ISBN 1-931018-31-6. ↑ Forest, James H. (1999). 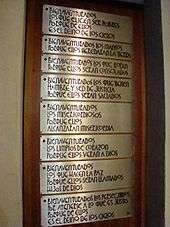 The Ladder of the Beatitudes. New York: Orbis Books. 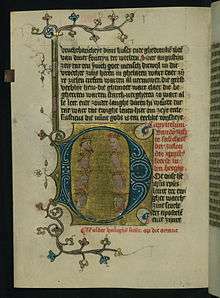 p. 17. ISBN 978-1-57075-245-2. 1 2 3 4 Aune, David Edward (2003). The Westminster dictionary of New Testament and early Christian literature. pp. 75–78. ISBN 978-0-664-21917-8. 1 2 3 4 5 Beatitudes. Catholic Encyclopedia. Retrieved September 5, 2013. 1 2 3 4 Hastings, James (2004). Dictionary of the Bible: dealing with its language, literature, and contents, including the Biblical theology. Honolulu, Hawaii: University Press of the Pacific. pp. 15–19. ISBN 1-4102-1730-2. ↑ France, R.T. (October 1987). The Gospel According to Matthew: an Introduction and Commentary (1 ed.). Leicester: Send the Light. ISBN 0-8028-0063-7. ↑ Hill, David (June 1981). New Century Bible Commentary: Gospel of Matthew. Grand Rapids: Eerdmans. ISBN 0-8028-1886-2. ↑ Nietzsche, Friedrich (1999). On the Genealogy of Morals (Zur Genealogie der Moral) orig. 1887 (PDF). Oxford University Press, USA. ISBN 9780192836175. 1 2 Jegen, Carol Frances (1986). Jesus the Peacemaker. Kansas City, Missouri: Sheed & Ward. pp. 68–71. ISBN 0-934134-36-7. ↑ Torretto, Richard (2010). A Divine Mercy Resource. New York: iUniverse Inc. pp. 53 and 126. ISBN 1-4502-3236-1. ↑ Ridges, David (2007). The Book of Mormon Made Easier, Part III. Springville, Utah: Cedar Fort. pp. 148–149. ISBN 1-55517-787-5. 1 2 "Third Nephi, Chapter 12". The Book of Nephi. Church of Christ (Latter Day Saints) LDS.org. 3: 3. Retrieved September 5, 2013. 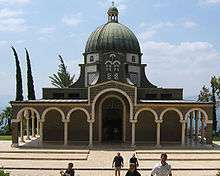 ↑ Bahá’u’lláh (1988). Tablets of Bahá’u’lláh Revealed After the Kitáb-i-Aqdas (pocket-size ed.). US Bahá’í Publishing Trust. p. 269. Retrieved September 4, 2013. ↑ Akhtar, Shabbir (December 19, 2007). The Quran and the Secular Mind. London, New York: Routledge. p. 380. ISBN 0415437830. 1 2 Randall, Albert B. (2006). Strangers on the Shore: The Beatitudes in World Religions. pp. 41–44. ISBN 978-0-8204-8136-4. ↑ Spiro, Melford E. (May 27, 1982). Buddhism and Society. p. 359. ISBN 0520046722. Easwaran Eknath. Original Goodness (on Beatitudes). Nilgiri Press, 1989. ISBN 0-915132-91-5. Twomey, M.W. "The Beatitudes". A Dictionary of Biblical Tradition in English Literature. David Lyle Jeffrey, general editor. Grand Rapids;: W.B. Eerdmans, 1992. Wikimedia Commons has media related to Beatitudes. Catholic Encyclopedia: The Eight Beatitudes (New Advent).